The cytoskeleton is an important, complex, and dynamic cell component. It acts to organize and maintain the cell's shape; anchors organelles in place; helps during endocytosis, the uptake of external materials by a cell; and moves parts of the cell in processes of growth and motility. There are a great number of proteins associated with the cytoskeleton, each controlling a cell’s structure by directing, bundling, and aligning filaments. Cytoskeleton is a set of long, thin fibers that contained in the eukaryotic cytoplasm, and it has many membrane-enclosed organelles. There are at least three important roles about cytoskeleton: Cytoskeleton maintains cell shape and support. Cytoskeleton provides for various types of cellular movement. 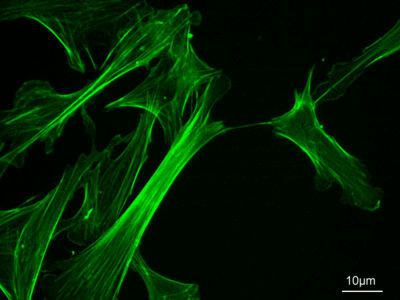 Some of the fibers of cytoskeleton act as tracks or supports for motor proteins, which help move things within the cell. Microfilaments, intermediate filaments, and microtubules are the three components of the cytoskeleton (Purves 79). Actin and tubulin are both protein molecules that polymerize into fibrous structures, known as the cytoskeleton, inside cells. Both types of fibers are involved in establishing cell shape, cell movement, and moving things around inside the cells. Microfilaments can presence as single filaments, in bundles, or in networks. They are about 7nm in diameter and several micrometers long, and they are gathered together from actin, a protein that exists in several forms and has many functions among members of the animal phyla. In muscle cells, actin fibers are connected with another protein, myosin, and the interactions of these two proteins statement for the contraction of muscles, but in non-muscle cells, actin fibers are connected with the same changes of shape in the cell. Microfilaments have two major roles: They help the entire cell or parts of the cell to move. They maintain the cell shape. They are involved in a flowing movement of the cytoplasm called cytoplasmic streaming and in the "pinching" contractions that divide an animal cell into two daughter cells. They are also enable some cells to move by involving in the formation of cellular extensions called pseudopodia (Purves 79-80). In some cell types the microfilaments inside the plasma membrane formed a meshwork. The microtubules formed a firm structure which can supports the cell by using actin-binding proteins then cross-link it. For example, microfilaments support the tiny microvilli that line the intestine, giving it a larger surface area through which to absorb nutrients (Purves 80). Intermediate filaments only found in multicellular organisms. Compare with the other components of the cytoskeleton, there are at least 50 different kinds of intermediate filaments, usually particular to a few cell types. Intermediate filaments have two main structural functions: They stabilize cell structure, and they can counteract the tension. In some cells, intermediate filaments radiate from the nuclear envelope and may keep the locations of the nucleus and other organelles in the cell. The lamina of the nuclear lamina are intermediate filaments. Other kinds of intermediate filaments can help hold a complicated organs of microfilaments in place in muscle cells. And other kinds also stabilize and help maintain rigidity in surface tissues by connecting "spot welds" called desmosomes between adjacent cells (Purves 80-81). Microtubules are long, vacant, unbranched cylinders about 25 nm in diameter and is equal several micrometers long. There are two rules of Microtubules in the cell: Microtubules can form a really hard internal skeleton for some cells, and they also acts as a configuration forth which motor proteins can move structures in the cell. Microtubules are assembled form molecules of the protein tubulin. Tubulin is a dimer--a molecule made up of two monomers. The polypeptide monomers that make up this protein are known as alpha-tubulin and beta-tubulin. There are thirteen chains of tubulin dimers enclose the central cavity of the microtubule. 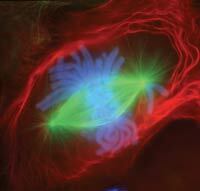 Microtubules help control the arrangement of the cellulose fibers of the cell wall of plants. The electron micrographs of plants often show microtubules lying just inside the plasma membrane of cells that are forming or extending their cell walls. Experimental alteration of the orientation of these microtubules leads to a similar change in the cell wall and a new shape for the cell. In addition to their role in the cytoskeleton, microtubules are also substantial in separating chromosomes to daughter cells during cell division, and they are intimately associated with movable cell appendages: the flagella and cilia (Purves 81). ↑ What is a Cell? by the National Center for Biotechnology Information. Purves, Sadava, Orians, Heller. Life: The Science of Biology. 2004. Sinauer Associates, Inc. W.H. Freeman and Company. This page was last modified on 20 June 2016, at 00:16.